We made our way along the path through the woods and struggled up a steep trail carved out by mountain bikes. Eventually the path flattened and we were on a low ridge, though still under the canopies of hornbeams and beech trees. We caught glimpses of a meadow in the sunlight. A single oak stood before us, and beyond lay the expanse of the plateau ringed by forest, a clearing graced by 400 year old oaks. Sheep and goats sheltered there, some guard dogs blinked at the sun, and we were in Arcadia. This is a typical (and real) example of a spatial transition, characterised in this case as a move from a situation involving some struggle, even frustration, and leading to the achievement of a goal, or perhaps a reward. The experience is underpinned by expectation, anticipation, and excitement. There’s also an element of the unexpected. Perhaps the travellers were primed for some surprises. The description here is undeniably cultural and value laden. There’s an ascent, transition to a clearing in the forest, a return to a bucolic landscape, an account redolent of classical idealism, romance and a slight lament over mechanisation (mountain bikes). There’s also a geometrical transition, from confinement and a restricted perspective to a wider view. Here’s another example, loaded less with a romance for the natural. Once above the trees I saw the outline of a ridge saddled between peaks. A faint jagged line cut across the slope. 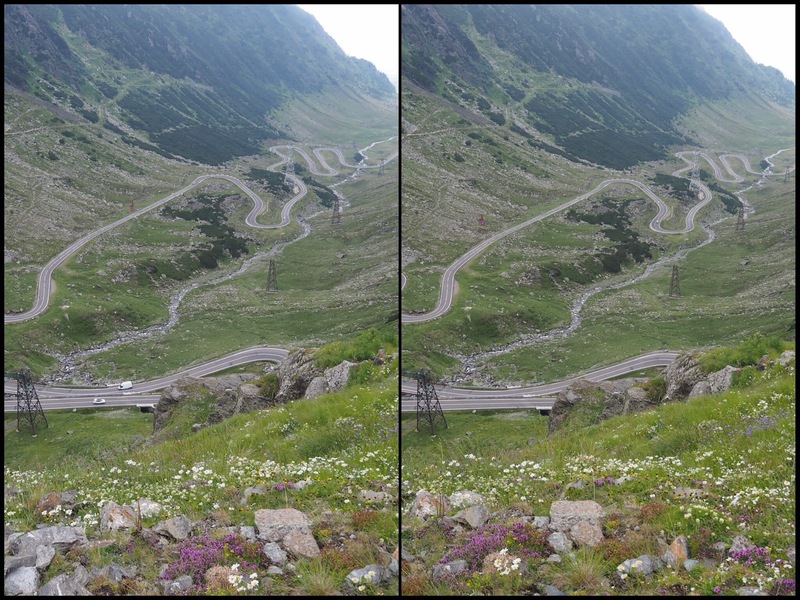 This was the famous Transfăgărășan, or national route 7c, through the Transylvanian Alps. I stopped the car a few times on the ascent, but the expanse of the road’s twists and turns evaded the camera. Eventually we were somewhere near the top, and the drama of Ceaușescu’s expensive military access route was in full view, and the road snaked down the valley into oblivion. In both examples the narrative concludes with a broader view, a wider perspective, a resolution, that in a previous post I attempt to align with the aha moment in problem solving. Here’s a third example alluding to built urban space. Two towers, a dome and gabled roofs projected above the reconstructed walls of the citadel. We breached the outer wall through a broad path between massive battlements made of brick. 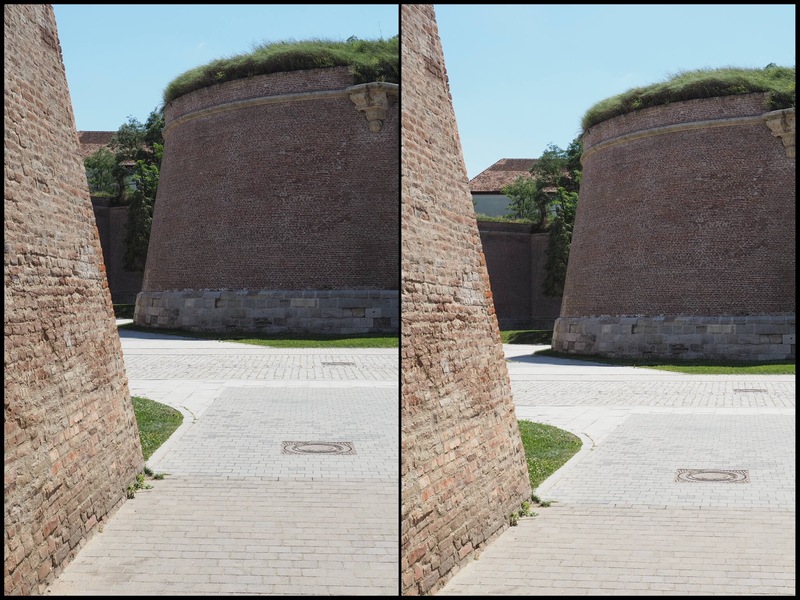 A few turns in this outer labyrinth took us not into the open plazas of the restored military town but the wide sunken space between its outer and inner defences. This brick and concrete valley stretched to the right and the left. The wooden bridge into the city arched above and out of reach. The experiences I attempt to relate here in words and images constituted recent moments of pleasurable surprise. I like to think of such encounters as geometrical as well as spatial, perhaps captured in these stereograms. These geometrical transitions also linger in the memory, aid recollections at après holiday dinner parties and on social media, and contribute to long term feelings akin to satisfaction at moments shared, and sociability in general. I took the first set of stereograms with a 3D app on an iPhone. That involves taking first the left photo, then moving a little to the right to take a second. The app helps with alignment, though it’s still hit and miss. Mobile objects in the field of view, such as sheep, people or branches blowing in the wind, produce odd effects. 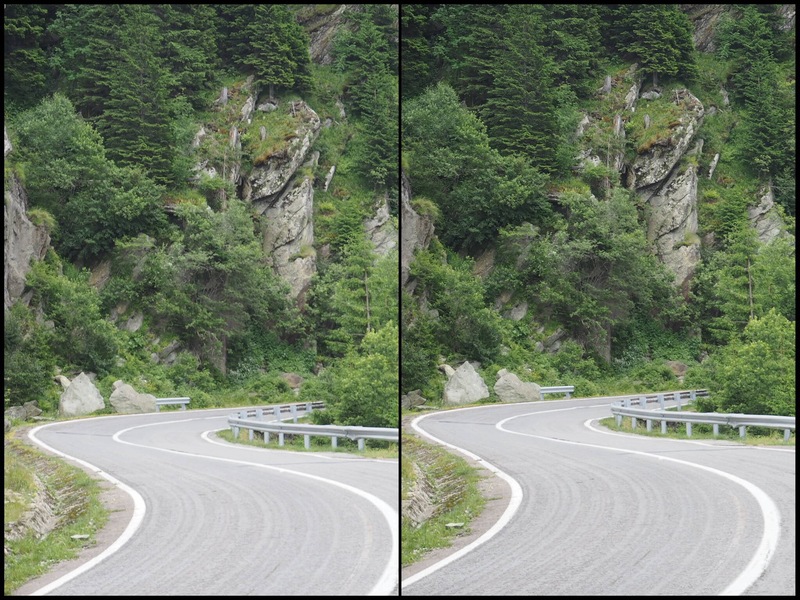 Most people can view stereograms without special glasses, and with a little practice. Adjust the image size. Zoom out in the browser window so the white dots (first two stereograms only) are about 6 cm apart. This is easy on a standard iPhone. Stare at the two white dots until they split into 3, i.e. stare straight ahead so the dots overlap to produce a third. Then look down at the images. The procedure can cause eye strain. 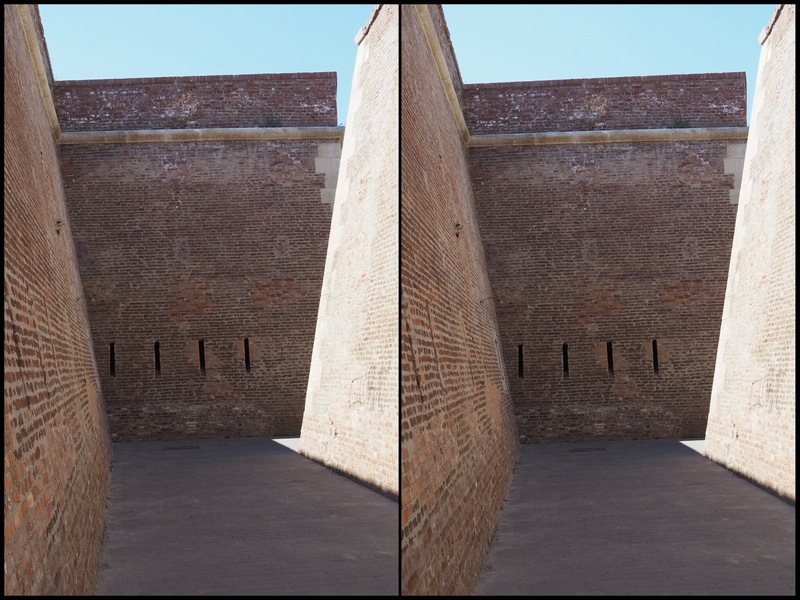 Align the black frames in a similar manner in the case of the other stereograms, taken with an Olympus OM-D. The first images are of the Breite Oak Tree Reserve near Sighisoara; the second are of the Transfagarasan highway; the third set are from the town of Alba Iulia — all in Romania. Also see blog posts: A sudden prospect, Aha moments, and Frustration. Are the affects here not the result of a sequence of events. Geometry as applied to walking being restricted to circular and possibly triangular walks or taking two sides of a square (rectangle) to get from A to B. Or in a more artistic mode walking the line, as with Richard Long, Iain Sinclair or Tim Ingold.